While the staff at the Northeast Indiana Veterinary Emergency and Specialty Hospital (NIVES) is accustomed to handling pet emergencies, we know it can be a stressful time for both you and your pet. The key to making it as stress-free as possible is preparation. Below are guidelines to prepare for an emergency, including a list of conditions that warrant emergency treatment. Getting prepared for an emergency begins well before there is ever a concern for an emergent situation. In the event of a natural disaster or crisis that requires emergency evacuation, the ASPCA recommends that each pet should have an EVAC-Pac. 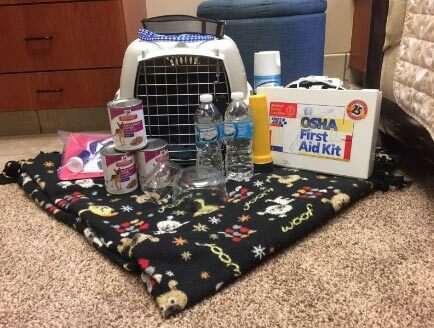 More information for what to include in this kit can be found by following this link http://www.aspca.org/pet-care/general-pet-care/disaster-preparedness. There may be a situation when your pet requires care by a veterinarian that is not familiar with their history (you are traveling out-of-town, an emergency happens after hours, etc). It is important to have a plan if this situation occurs. There are many conditions that warrant emergency treatment. If you are concerned about your pet, please call your veterinarian or an emergency veterinarian as soon as possible and they will help guide you on how to proceed. The following is a list of conditions that should be seen immediately. My Pet is Suffering from an Emergency! What Should I Do? Don’t panic! If you have the ability to call your primary care veterinarian or an emergency veterinary hospital, do so. They will be able to help guide you on how best to handle your situation. If your pet has just been involved in a dog fight or an accident involving a vehicle, first ensure human safety before trying to assist your pet. Do not try to rush into oncoming traffic or try to break up a dog fight without proper assistance. We all know how much your pet means to you, but your safety is our top priority! Once the situation is safe, carefully approach your pet. Even the sweetest dogs may try to bite when they are stressed and in pain. Take extra care when trying to move your pet to get them to emergency treatment. A large, fluffy blanket or towel can make a safe barrier between you and your pet to allow safe travels to the nearest treatment location. If the pet is small enough, placing them in a box can help safely contain them. Do not give your pet ANY over the counter medications without veterinary supervision. This may exacerbate any emergency condition your pet may have and prevent your veterinarian from administering further needed medications or diagnostics. Emergencies can happen at any time and being prepared can help make them a little less stressful. When in doubt, contact your veterinarian or an emergency veterinarian for guidance if you are worried about your pet. In all circumstances, keep calm and safety first. You cannot appropriately care for your pet if you are injured. 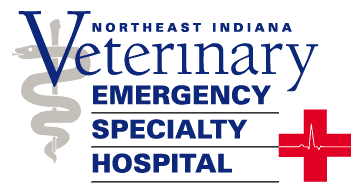 The Northeast Indiana Veterinary Emergency and Specialty Hospital (NIVES) has an emergency veterinarian and technical support staff on-site at all times. If you questions about a possible emergency please call us at (260) 426-1062 or bring your pet directly to our hospital.